To prepare omelet with broccoli, chicken and cheese, boil chicken breast with salt and pepper. Wash broccoli, and boil with salt and pepper for about 4-5 minutes. Dry boiled broccoli. Chop onion and saute. Mix 4 eggs, 3 tablespoons of sour cream, squeezed one garlic clove, salt, black pepper and red pepper in a saucepan. Whip until smooth. Boiled chicken cut into small pieces and fry with onion for about 2 minutes. Add to the pan, cut into a smal pieces broccoli, fry for 2 minutes, after that pour a saucepan content into a pan. Put Carefully put sliced tomato into a pan and cover. Fry omelet for about 10 minutes on a gentle heat. Grate cheese on a small grate. Add to omelet and cover for a few minutes. 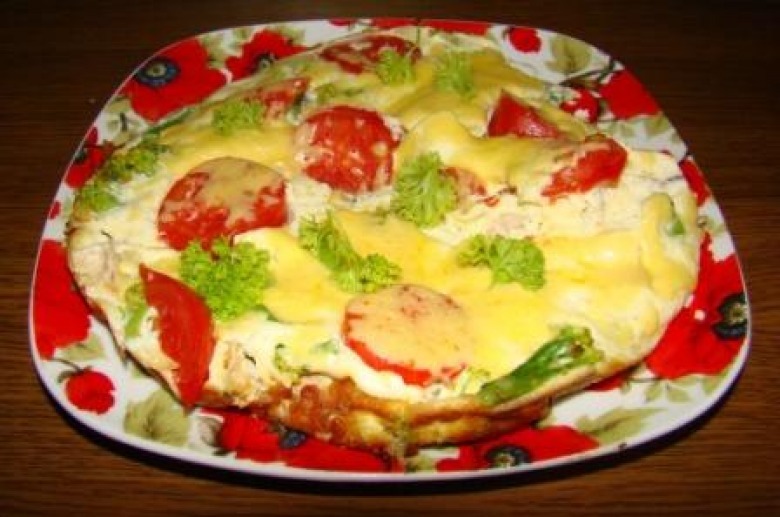 Omelet with broccoli, chicken and cheese serve hot and garnish with greens. 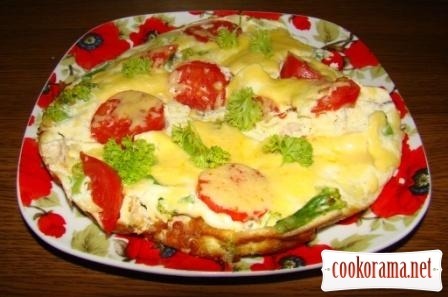 Top of recipe "Omelet with broccoli, chicken and cheese"
ОГО! Прикольно. І Юрчик смакоту їсть!